Okay, I’m pretty sure I have found the perfect little black dress you will wear all holiday season. This dress will take you from work to date night, happy hour, or post work event seamlessly. It would also be perfect to wear to an office holiday party or dinner party. Overall, I would wear this outfit to work exactly as is except I would probably go with a little less glam earring choice like studs or simple hoops. Transitioning this dress from day to night can be easy as changing out your accessories. You can add a pair of statement earrings like I did in this post. Changing out your heels to a fun colorful pair like red for a holiday party or date night is another simple swap. Metallic heels are so popular right now and would be perfect for an event or happy hour. I have such a weakness for little black dresses that can work so perfectly in a variety of situations with just a few accessory swaps. I love this dress for the holidays because the calendar is filled with parties and events and having one dress for all of them can be good for your budget. 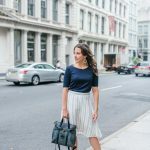 This dress can be glammed up or kept very simple to work in a variety of parties from cocktail to Thanksgiving dinner to casual post work drinks with friends. 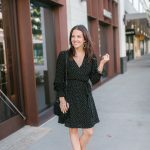 If you want one dress that will carry you from fall to winter, I found it! Speaking of holiday parties, I am headed to a fun Halloween party this weekend! I’m so excited to be gathered with all my friends and catch up. I’m a huge fan of dressing up and playing with fun makeup ideas, and so are many of my friends. I can’t wait to see what everyone wears this year. I hope ya’ll have a fabulous weekend and thanks for stopping by! Gorgeous in black. I love this black dress. It is not too long not too short. it has the perfect length. I think everyone should own a great classic black dress. This one with the wrap is so good! I love this black dress on you. Perfect for any fall/winter event. By the way the michael kors blaze open toe bootie from 2 weeks ago finally arrived yesterday and they are perfect. Wearing them today. YAY! Glad you liked them! I wore mine twice this week! That is such a pretty dress! I can’t do heels but i like looking at them.